The modeling of flexible objects, in particular cables, wiring harnesses and hoses, is an essential key technology for many of our industrial partners. Physically correct and real time movements of flexible components provide designers with unprecedented levels of certainty in all sorts of applications. At FCC we have developed a number of pioneering tools to provide users with real time simulation of flexible cables and surfaces. 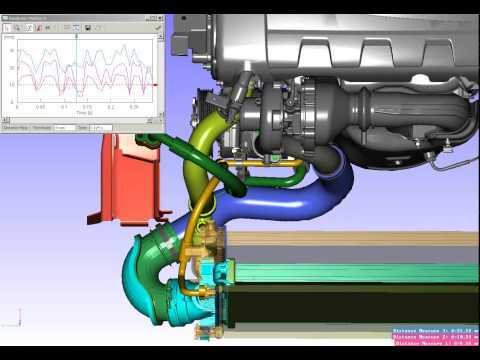 Movie: This simulation is performed in IPS Cable Simulation to predict if the hoses connecting the engine and the cooler are at risk of wear when the engine moves relative to the cooler. The motion of the engine is imported from real-world data of a car driving in rough terrain. FCC has developed a number of virtual tools that set the standard for physically correct cable models. We have developed in-house our own models of cables that provide real-time performance but also have the guarantee of physical verification. Our tools enable users to specify a complete design of flexible components that are inter-connected and attached with clips to static or moving surroundings. We are also able to provide users with information on numerous cable properties such as torsion, shear, tension, etc. In addition, users can combine numerous cables with correct contact handling between them or auto-route cables through complex environments collision-free. In addition to our work on cables, we have also developed tools to model flexible surfaces and demonstrated their real-time performance on standard hardware. 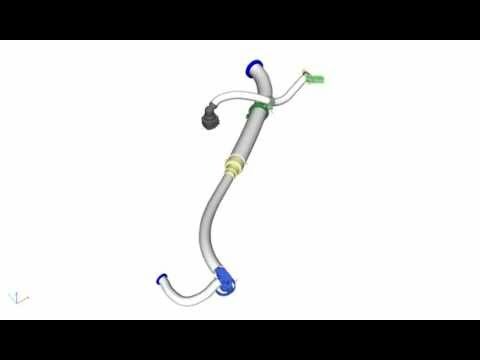 Movie: In IPS Cable Simulation, the motion of cables or hoses can be simulated including a variety of different clips. The user can even design his or her own clips through importing the geometry and defining the degrees of freedom in the intuitive graphical user interface of IPS. Our flexible cable simulator software is used in numerous applications such as correct model engine packing and design, assembly planning, wiring harness design and manufacturing, robot cable dress packs, and many more.